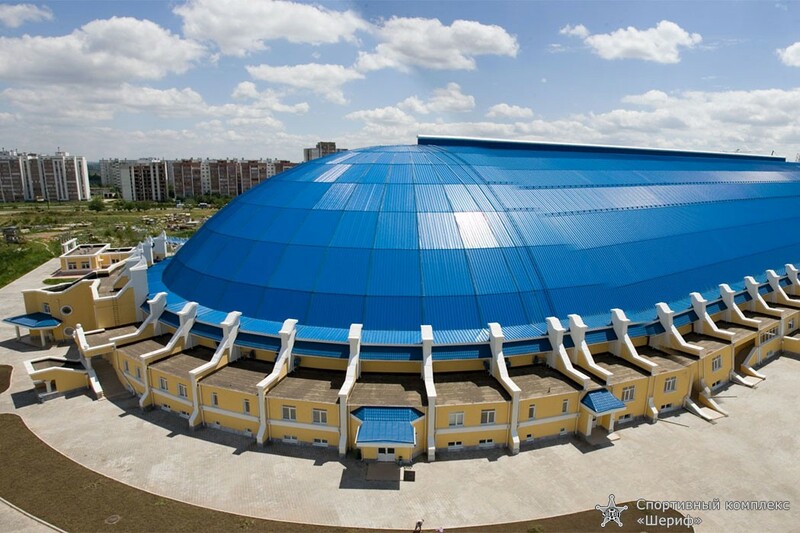 The covered arena is maintained from a second half of 2004 and is one of the most unusual constructions of the “Sheriff” sports complex by right. Covered completely, the heated arena is intended for 3570 spectator seats and allows carrying out football matches in comfortable conditions during an autumn-winter period. The unique structure of the 37 meters covered arena is equipped with systems of ensuring similar to those that are established on the main and the small arenas of the “Sheriff” sports complex. The covered arena is equipped with up-to-date acoustic system from the well-known German “Electro Voice”, providing a sound on tribunes, and also by adjustable system of illumination operating in three modes – 200, 800 and 1600 lux. The power system of the stadium passes on to a reserve power automatically, and, if necessary – to autonomous mode, if main power source is cut off. There are individual metal tip-up seats on tribunes. Buffets and lavatories for spectators are located in under tribune premises. At the covered arena there are dressing-rooms for arbiters and players, commentator cabins, the press centre, the conference-hall and opened VIP-boxes. The playing ground of the covered arena, sized 105 to 68 meters, has artificial surface of the fourth generation from the “Field Turf” and effective drainage system. Surface high degree reliability factors, conformities to the highest quality standards of international organization on standardization and great experience in the sphere of artificial surfaces manufacture became basic when choosing the surface of the given company. At the southern tribune of the stadium up-to-date colorful scoreboard with total area of 40 sq. m. is mounted. Scoreboard possibilities allow informing spectators about lineups, current match score, viewing replays of impressive playing moments, etc. The stadium TV system allows broadcasting matches live. 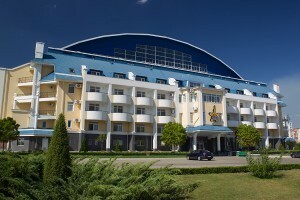 In the southern part of the stadium there is hotel complex for FC “Sheriff” players and coaches. 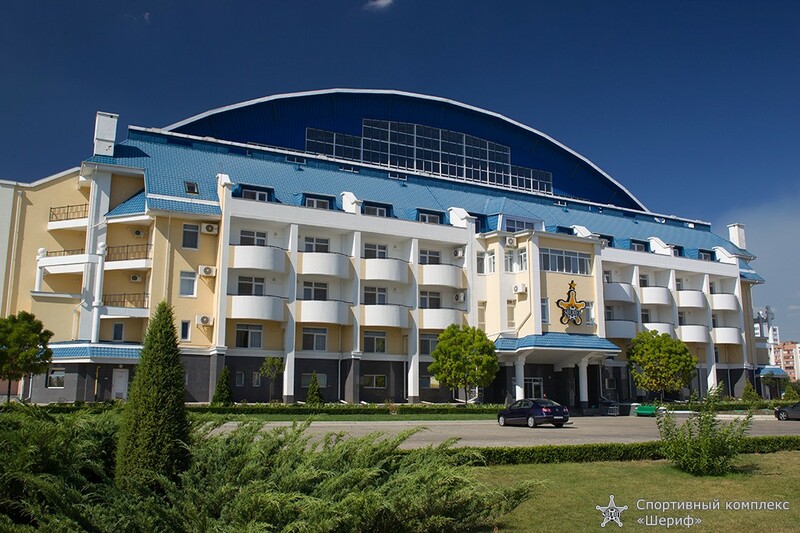 Besides comfortable and cozy four-star numbers it includes gyms, where player can train if the weather is bad, massage rooms, playing and computer rooms, shower cubicles and sauna with small pool. Besides football ground in the northern part of the arena there is big playing hall for holding tournaments on such sports, as: indoor football, volleyball, basketball, handball and others. The hall is intended for 860 spectator seats and equipped with electronic scoreboard. Around the covered arena of the “Sheriff” sports complex lawns with evergreen grass are laid out, there are parking and convenient control posts through which spectators come directly to the stadium.